Most of the mental and physical growth of babies happens during sleep. This is why you need to make sure your little one has a warm, comfortable and high quality cot. With cosy bedding, you can ensure that your newborn gets all the rest he/she needs to grow. To help you select the best for your baby, here is a guide for all the essentials of comfortable newborn bedding. In the first few months, your baby will most likely sleep in the same room as you. You can choose to let your newborn sleep inside a crib or a Moses basket. Note that cribs are bit bigger than Moses baskets. Cribs have wooden slats allowing you to see your baby. On the other hand, Moses baskets are a portable choice, since they are made from wicker or woven palm. These baskets are sturdy enough so you have nothing to worry about. Note that since cribs are slightly bigger, your baby might be able to use it longer. But you have to make some adjustments when he/she starts moving around more. Babies don’t really need beddings like quilts or pillows. These are bulky items that will make the bed too hot for your baby. Babies do need a mattress though. It should be one that’s comfortable and fits snugly in your baby’s crib or basket. You will need sheets for the crib. You will need more of them for surprise changes of beddings, especially if you haven’t had time to wash the soiled ones. You need fitted and flat sheets for your baby. The fitted sheets are important as they don’t come away even when your baby wriggles. You need about four of them to cover the mattress so your baby will be warm enough while he/she sleeps. The flat sheets can be used independently when in warmer rooms. In colder rooms, you can use a blanket. These sheets are great as a spare when your fitted sheets are still in the wash.
Cotton – Pure cotton sheets are great because they’re soft, breathable, and safe. Moreover, they keep your baby warm during cooler months and cool during warmer months. Polyester – This is made from synthetic material so they’re cheaper than cotton. 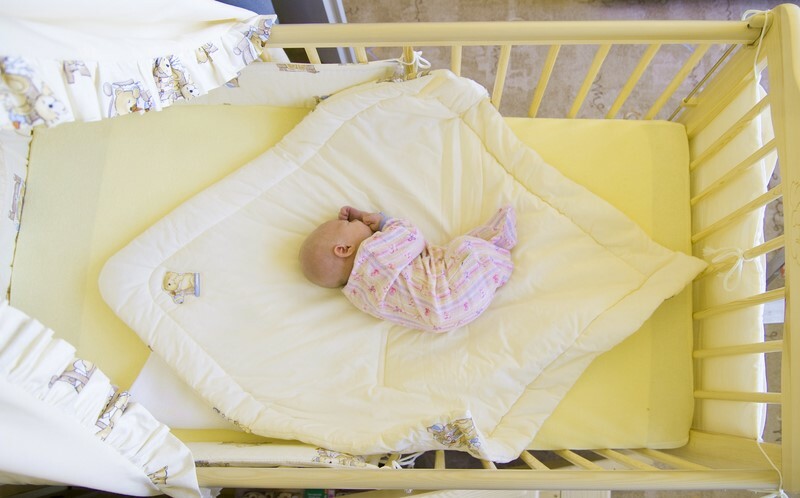 Today, polyester sheets that are safe for babies are widely available. Flannel – Flannel is a warm material that makes it ideal for baby sheets during cooler nights or winter. By trapping warmth, it can keep your baby feeling warm even when it’s freezing outside. You will need extra blankets for instances when the sheets aren’t enough to keep your baby comfortable. Sleeping bags are great to ensure your baby is cosy all night, especially when he/she keeps kicking in his/her sleep. Besides these essentials, you also need to mind the temperature in your baby’s room to keep him/her comfortable. Babies usually sleep well through the night in temperatures between 16 to 20 degrees Celsius. The idea is to keep only simple and light supplies. With the tips above, you will be able to find the best items to make a cosy and warm bed for your newborn.